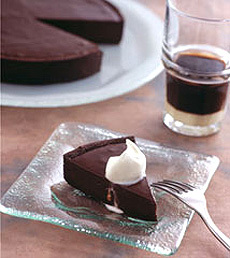 Chocolate Vietnamese Tart. Photo courtesy Pichet Ong. See the recipe. This page contains terms such as tarte Tatin, tea cake, vol-au-vent, whoopie pie and zeppole. This is Page 10 of a ten-page glossary. Click the black link below to visit other pages. See our many other food glossaries, each featuring a different favorite food. 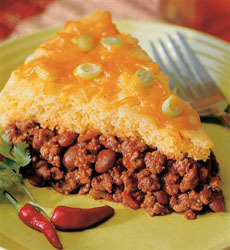 Skillet tamale pie. Photo courtesy of McCormick. Get the recipe. A tart is an open-face pastry with a base of plain or puff pastry dough, baked in a shallow tart pan that has either straight or fluted sides and a removable bottom, or in a metal tart ring placed on a baking sheet. The filling can be sweet or savory. The crust is firm but crumbly; the tart is removed from the tart pan or ring before serving. Tarts can vary in depth. To be completely accurate, “tart” refers to the full-size to full-size, multi-portion tart. 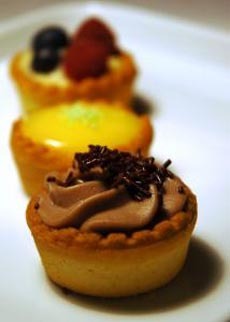 Individual-size size tarts are called tartlets; a mini tart is also a tartlet. Tarts can have sweet or savory fillings; the term includes flans, quiches and certain open-faced pies, like lemon meringue, that do not have top crusts. Bite-size tarts can be served as appetizers or as part of dessert trays. See the difference between tarts and pies. Milk custard in sugar crust. Some people think of Tarte Tatin as an upside-down cake. It is similar, but it is a one-crust, upside-down fruit pie, invented by accident in France in the early 1880s. It is baked upside-down with the fruit on the bottom and the crust on top. The Tatin sisters, Caroline and Stéphanie, ran the Hotel Tatin in Lamotte-Beuvron, southwest of Paris in the Loire Valley, not far from the town of Chambord. Stéphanie, preparing an apple tart, erroneously put the apples in the pan without the crust underneath. 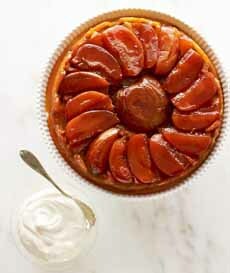 The apples caramelized, the customers loved it and the Tarte Tatin was born. The concept has been applied to other fruits—bananas, berries, pears, quince and stone fruits; as well as to savory tarts, such as beet, onion, potato and squash. Above: Apple Tarte Tatin. Here’s the recipe from Martha Stewart. 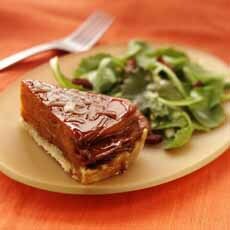 Below: A Butternut Squash Tarte Tatin from Eat Wisconsin Cheese. A tart filled with pastry cream and topped with sautéed apple, pear, or plum filling, then topped with a Grand Marnier glaze. 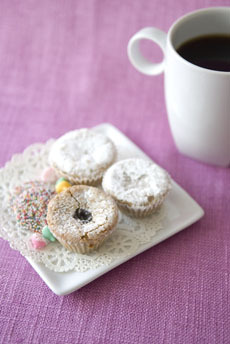 In different regions and countries, a tea cake means anything from a cookie to a loaf cake. In the pastry arena, it is a pastry round variously flavored. A timbale is an individual savory pie made of meats, fish or vegetables and cooked in a drum- or thimble-shaped mold called a timbale (the word is French for “tumbler”), and often served with a creamy sauce. Small pastry shells that hold creamy mixtures of minced foods are also called timbales. Timbale molds are also used for crustless presentations, for example of vegetable or meat custards. Tennessee Tea Cake. Photo by Corey Lugg | THE NIBBLE. A tourtière is a meat pie with origins in Quebec. Ground pork and/or veal, beef or game are used inland; salmon is commonly used on the coast. A paper-thin cookie, sweet or savory, often bent into a cupped shape so that it looks like a curved European roof tile (tuile is the French word for “tile.”). The tuile is rounded while hot from the oven, by being placed over a curved object such as a cup or rolling pin (there are also tuile molds) to cool and harden. A traditional tuile is made from crushed almonds, but the one with fluted edges in the photo at the right is made from Parmesan cheese. 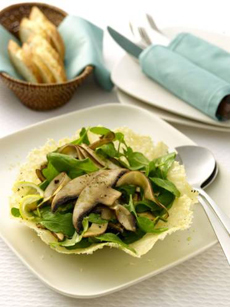 Arugula and portabella salad on a Parmesan tuile. Get the recipe. Photo courtesy MushroomInfo.com. A turnover is a kind of pastry made by placing a filling on a piece of dough, folding the dough over, and sealing it. Turnovers can be sweet or savory and are often made as a sort of portable meal or dessert, similar to a sandwich. It is common for sweet turnovers to have a fruit filling and be made with a short (pie crust-like) or puff pastry dough; savory turnovers generally contain meat and/or vegetables and can be made with any sort of dough, though a kneaded yeast dough seems to be the most common in Western cuisines. They are usually baked, but may be fried. Unlike pasties or empanadas, they are triangular in shape. 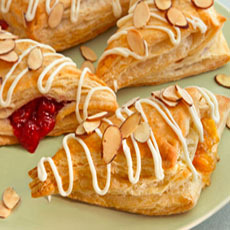 Cherry almond turnovers. Photo courtesy Pepperidge Farm. Viennoiserie refers to pastries made of laminated pastry dough (a.k.a. pâte à choux and puff pastry), an expensive (because of the amount of butter needed) and time-consuming process (because the butter is folded in-between layers of dough). This technique is used to make the flaky “breakfast pastries,” croissants, danish and brioche. It is a marriage between traditional bread baking and sweet pastry baking. You can see the striations, or layers, of pastry when you look at the top of the Viennoiserie or when you cut into them, and you can pull apart the layers of the baked dough. 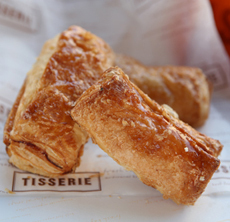 A cream cheese délice from Tisserie.com shows the flaky laminated pastry dough of Viennoiserie. According to legend (subsequently disproved), the croissant was created to commemorate the defeat of the Turks in Vienna; hence, the group of specialty breads became known as Viennoiserie. See croissant in our Bread Glossary for the accurate history. A small- (hors d’oeuvre) to medium-size hollow case of puff pastry. A round opening is cut in the top and the pastry cut out for the opening is replaced as a lid after the case is filled. The fillings can be as varied as the chef’s imagination, from creamed or curried kidney, mushrooms and sweetbreads to garlicky escargot or prawns to a fondue of cheeses with or without mushrooms and charcuterie, or even fruit and custard; but vols-au-vent are almost always savory. You can buy prepackaged vols-au-vent off the shelf, but check to see if they are made with butter. Otherwise, they will have a shadow of the flavor of what a good pastry chef would prepare. 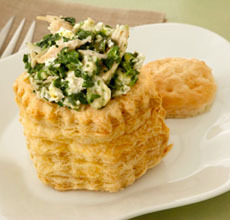 Vol-au-vent, called a puff pastry shell in English. Photo courtesy of Pepperidge Farm. Not a pie, but a cookie sandwich, with two soft cookies (most recipes are cakelike) that sandwich a fluffy filling. The original whoopie pies were chocolate with white filling, but today anything goes, as you can see in our review of Wicked Whoopie Pies; some artisan bakers specialize in red velvet whoopies and whoopie wedding favors (see WannaHaveACookie.com). Whoopie pies are popular in New England, particularly Maine, and in Lancaster County, Pennsylvania, where the recipe originated with the Amish (as the story goes, when Amish children would find the baked treats in their lunch bags, they would shout “Whoopie!”). 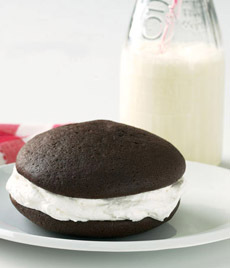 A classic whoopie pie. Photo courtesy Wicked Whoopie Pies. Whoopie pies are made in all sizes from jumbo (burger size) to miniature. Traditional whoopies pies are made with vegetable shortening instead of not butter, but some artisan bakers have improved on the ingredients so that people who discern and disapprove of the shortening can have their whoopie and eat it too. 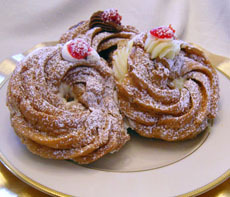 A popular Italian pastry, traditionally made to celebrate St. Joseph’s Day (March 19th). A kind of Italian doughnut, it consists of a fried puffed dough filled with pastry cream or a ricotta (cannoli cream) filling and dusted with confectioner’s sugar.